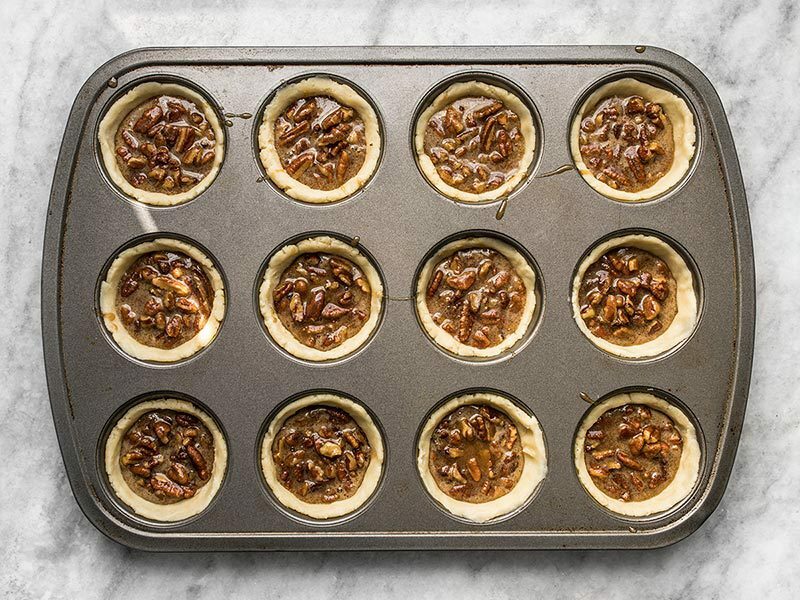 Whether you want to call these mini pecan pies or giant pecan tassies, they are the perfect little pre-portioned dessert for holiday gatherings (or for keeping in your freezer for when you want a little treat). 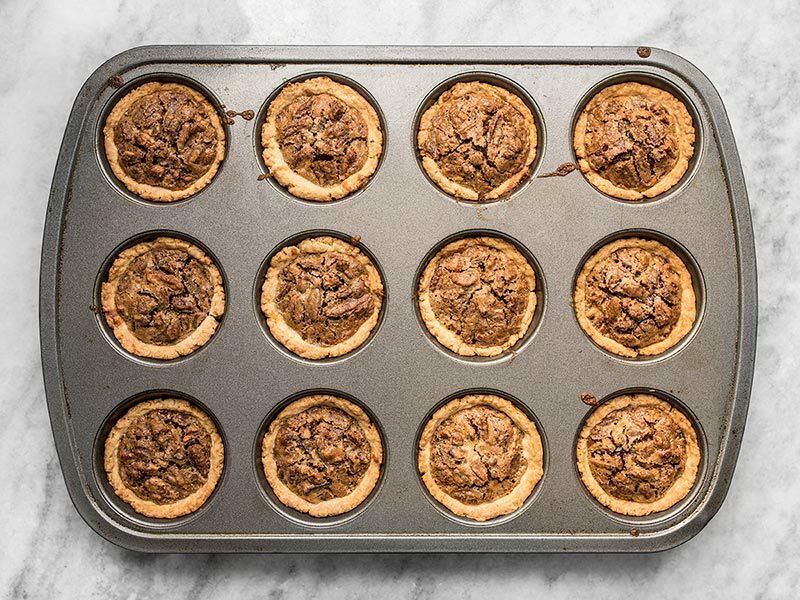 But the best part is that these Mini Dark Chocolate Pecan Pies are incredibly easy, so if you’re intimidated by pie baking, this is an excellent place to start. Pecan pies tend to be a little too sweet for me, so I added a little bitter dark chocolate to balance the extremely sweet caramel-y filling. I also experimented with adding a pinch of flakey sea salt to the top of a couple of the pecan pies, which was quite delightful! Want more holiday food? Check out our Holiday Recipes category. I used a 70% dark chocolate made by Moser Roth (sold at Aldi). If you want to go darker you can, just be mindful that the darker you go the more bitter it gets. The chocolate I used comes in a package with five mini bars, 25 grams each, and I used three out of the five. You can use more or less as you see fit. You can keep these Mini Dark Chocolate Pecan Pies in the refrigerator for up to four days, or, once completely cooled, place them in a freezer bag and freeze up to four months. 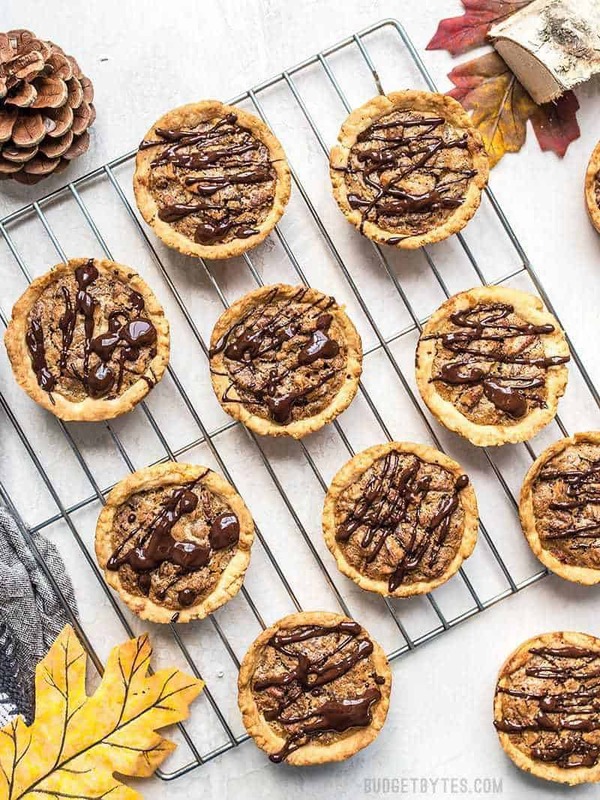 These easy Mini Pecan Pies studded with dark chocolate make the perfectly balanced and pre-portioned dessert for all of your holiday gatherings. Preheat the oven to 350ºF. 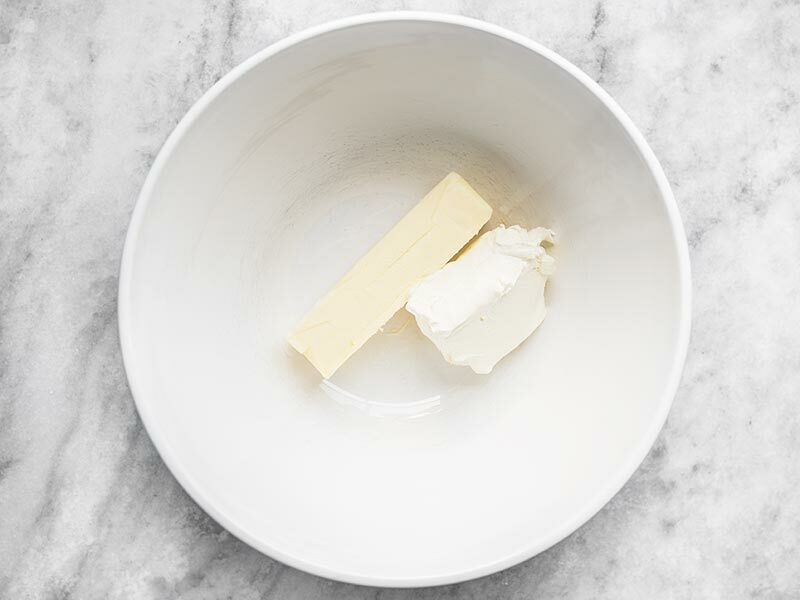 Beat together the butter and cream cheese in a large mixing bowl. Once combined, add 1 cup flour the sugar, and beat again until combined. The mixture may look dry and crumbly, but should stick together when squeezed with your hands. 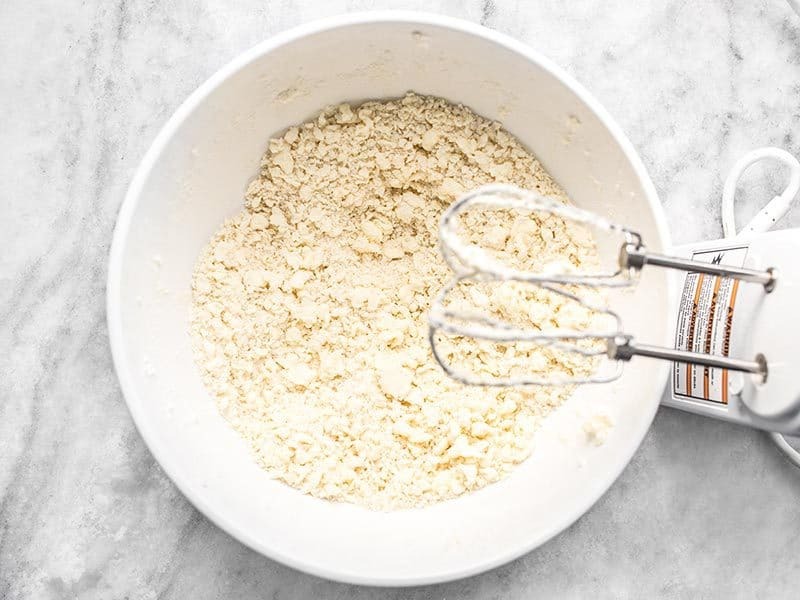 Form the mixture into a ball, adding an extra tablespoon or two of flour if it becomes too sticky. Divide the dough into 12 equal pieces. The easiest way to do this is to first divide the dough into four equal-sized pieces, then divide each of those into three. Roll each piece into a ball, then place each one in the well of a regular-sized muffin tin (NOT a mini muffin tin). The muffin tin does not need to be greased. 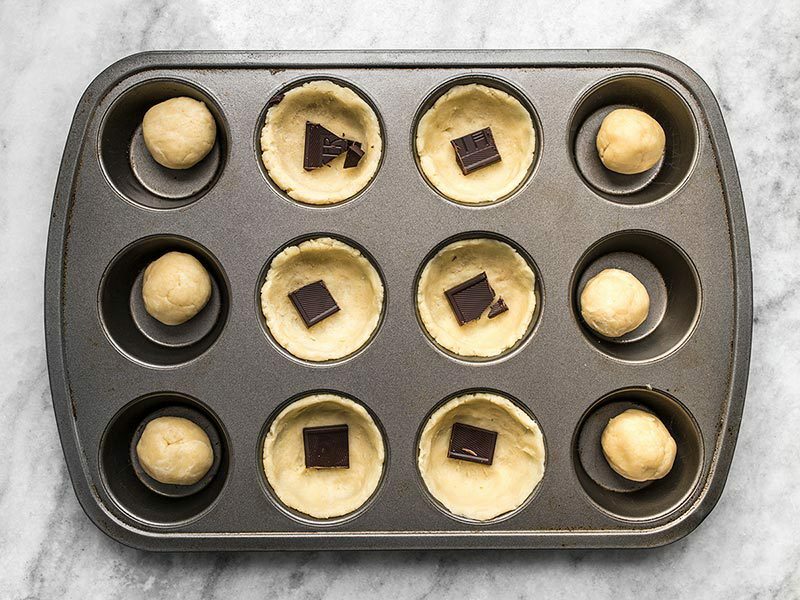 Use your fingers to press the dough balls into the bottom and up the sides of the muffin tin wells. It's okay if the dough does not reach the very top of the well. Make sure to press it deep into the corners, to avoid rounded thick corners. Place a dime-sized piece of chocolate into each of the shaped pie crusts. I used about 50 grams of the chocolate in the bottom of the pies, and the rest was used to drizzle on top after baking. To make the filling, add the beaten egg, brown sugar, melted butter, vanilla, and pecans in a small mixing bowl. Stir to combine, avoiding beating the mixture too much or causing frothy air bubbles. Spoon the mixture evenly between each of the pie crusts. The filling will only fill each pie crust about half way, but will puff up as it bakes. Once filled, place the muffin tin in the preheated oven and bake for 30 minutes. Once the pies are baked, melt the remaining 25 grams of chocolate. You can melt it using a microwave, heating for 15 seconds at a time and stirring well after each heating, until melted, or by placing a small bowl over a double boiler. Once melted, drizzle the chocolate over each pie. Allow the pies to cool completely, then use a small knife to gently lift them out of the muffin tin. Start by preheating the oven to 350ºF. Beat together 8 Tbsp (one stick) of room temperature butter and 4 oz. of room temperature cream cheese until they are evenly combined. Add 1 cup all-purpose flour and 1 Tbsp sugar, and beat again until the mixture looks loose and crumbly. 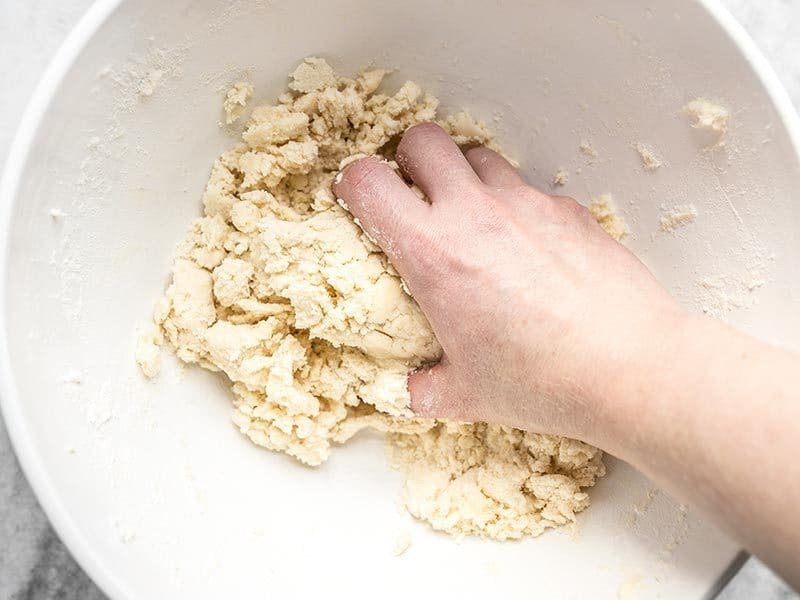 Although the dough may look dry, it should stick together when squeezed with your hand. Shape the dough into a ball, adding another tablespoon or two of flour if it becomes too sticky. Divide the dough into 12 equal-sized pieces. The easiest way to do this is to first divide it into four equal pieces, then divide each of those into three pieces. Roll each piece into a ball, then place each one in a well of a regular sized muffin tin (not a mini muffin tin). Use your fingers to press the dough into the bottom and up the sides of the wells. Make sure to press it deep into the corners to avoid rounded thick corners. This will help it extend further up the sides, too. Place one small dime-sized piece of chocolate in the bottom of each pie crust. Next make the filling. 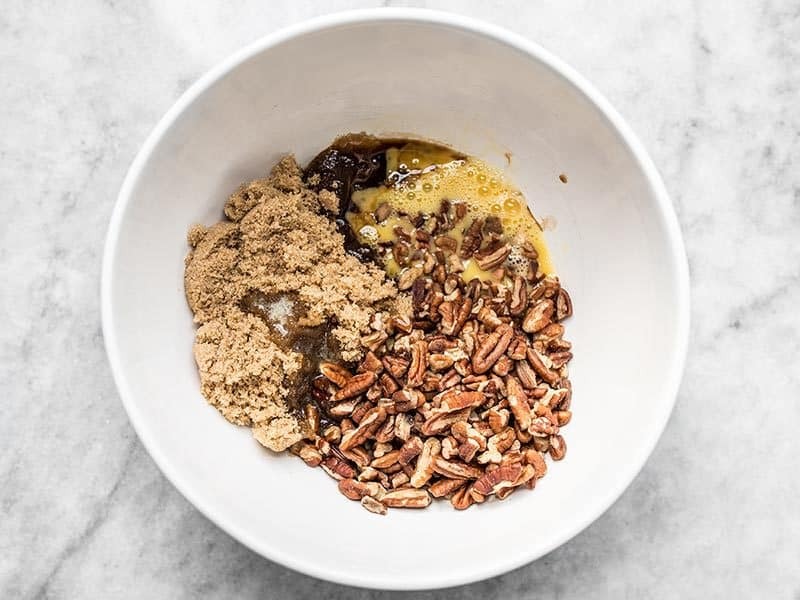 In a bowl combine one slightly beaten large egg, 3/4 cup brown sugar, 1 Tbsp melted butter, 2/3 cup pecan pieces, and 1 tsp vanilla. Stir these ingredients together with a spoon, trying to avoid vigorous beating or causing it to get frothy or form too many air bubbles. Spoon the filling into each of the shaped pie crusts. It will only fill each one about half way, but it does puff up as it bakes. Bake the Mini Pecan Pies for 30 minutes, or until the crust is golden brown. Melt the remaining 25 grams dark chocolate either by microwaving in a small bowl for 15 seconds at a time, stirring well each time until it’s melted, or by placing the bowl over a double boiler. 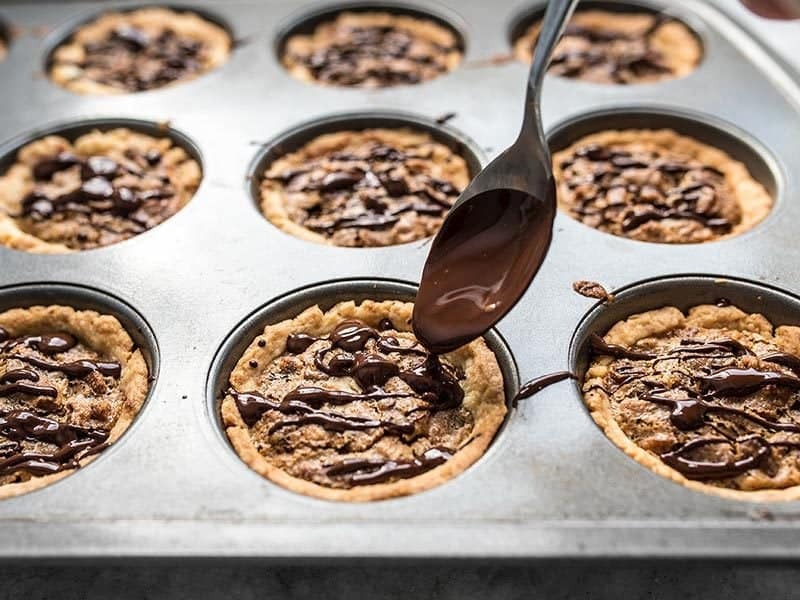 Once melted, drizzle the chocolate over each mini pecan pie. 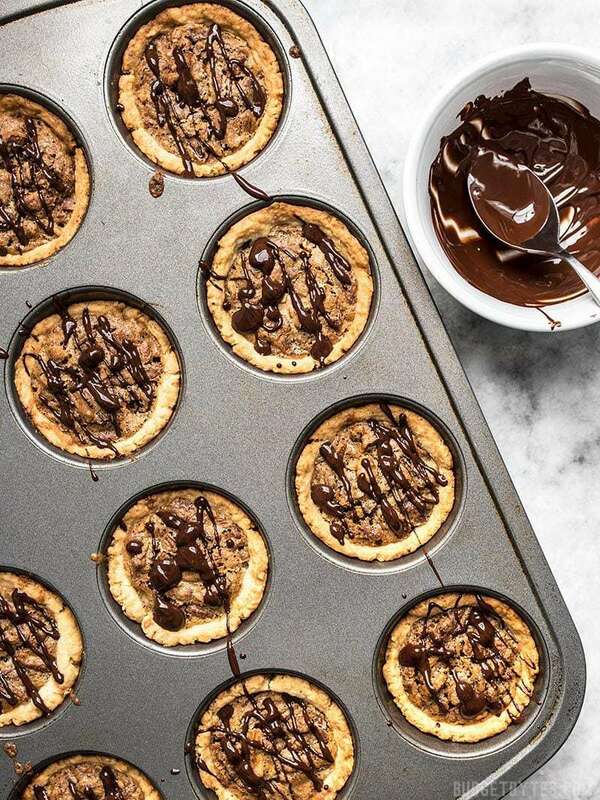 Allow the mini Dark Chocolate Pecan Pies to cool, then use a knife to gently lift them out of the muffin tin. Enjoy immediately or refrigerate for four days, or freeze for four months. This is amazing! I made these twice during the holiday and couldn’t get enough. Everyone raved that these were the best dessert! There is so much flavor in these little pies. Thank you for providing such amazing and easy recipes. I mainly cook from your site and always feel like you have such a nice variety to choose from. I’ve never made something from your site that wasn’t a hit. Keep these great options coming! These were a big hit! So delicious. These were incredible! They were a hit at Thanksgiving this year! :) Already been requested for Christmas! Beth! You’ve seriously outdone yourself with this recipe! I’ve been following you for many years, and this is seriously one of the best desserts I have ever had. I used semi-sweet chocolate chips that I chopped up, because I didn’t have some dark chocolate around. They were amazing! And the crust was so buttery and flakey! I made them on Thanksgiving where they were polished off, and then made another batch the next day lol. Love them! I needed to make a gluten-free dessert for our Thanksgiving meal, so I decided to try converting this recipe- it turned out SO GOOD!! For the crust, the only changes I made were to use Bob’s Red Mill One-to-One flour in the same amounts as the recipe calls for, and I also used Daiya dairy-free cream cheese because I already had some in the fridge. The filling I kept the same. My husband and I tested them out last night, they are fantastic! (and so cute!) 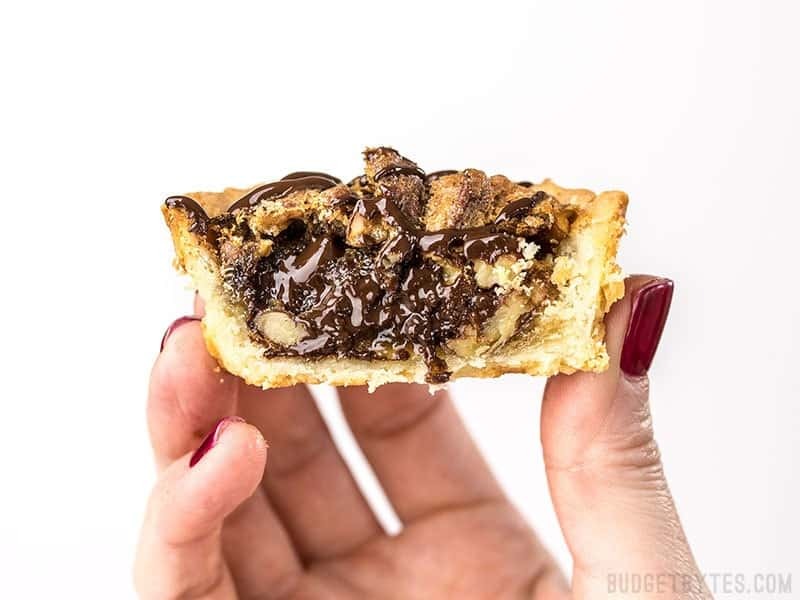 The crust has a really delicious, almost shortbread-like texture and taste, and the filling is awesome too- you can’t go wrong with pecans, brown sugar and chocolate! So if anyone wants to make them gluten-free, you totally can! I believe you could also successfully make them completely dairy-free by using dairy-free cream cheese and butter (like Earth Balance buttery baking sticks), and something like Enjoy Life chocolate bars or chips for the filling and topping. Just tried this recipe this past weekend as a test because I’m a terrible baker and they came out EXTREMELY DELICIOUS! I can’t wait to impress my family this year with this recipe! I’ve never tried to reheat something like this in the oven, but if I did I’d probably wrap them in foil to make sure they don’t dry out. These were delicious! I baked them until just barely brown and then reheated in the oven for 15 min covered in foil and they were perfect and melty. I also added 2 tablespoons of bourbon to the filling which added some nice flavor. Thanks for the recipe! Curious if the the amount of ingredients would convert to make a full pie rather than the personal size?! Looks so good! It’s really hard to say without testing it, unfortunately. 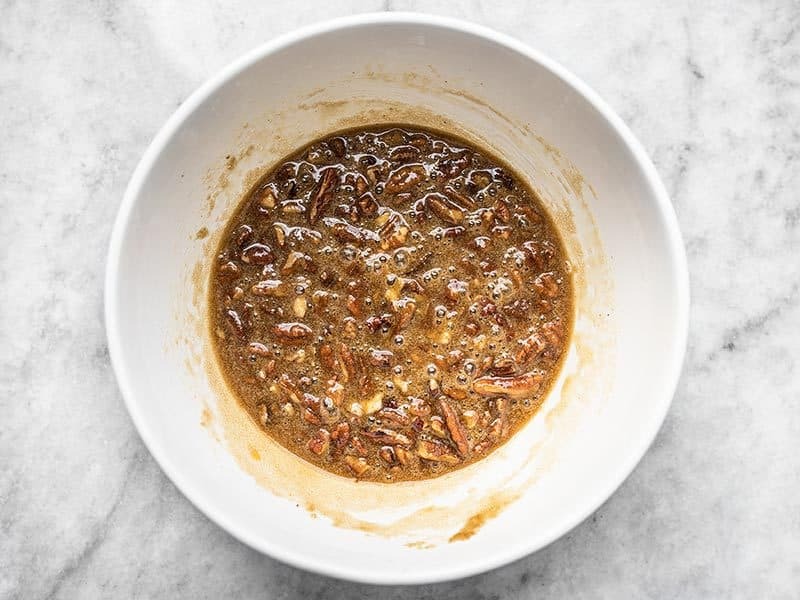 Baking isn’t quite as forgiving as other cooking methods, so you might be better off finding a recipe specifically written for a whole pecan pie. These are delicious! Had to sample the first batch ;) and will definitely be making more to bring to holiday parties!! I made these for a friends giving, and they were a huge hit! Mine didn’t look quite as nice as yours , but they were delicious. I actually completely forgot the sugar in the crust, and they were still very tasty lol! Hi–In the oven but I noticed there is no step to add the sugar to crust but it’s in list of ingredients. Which is correct? Thanks for catching that! I’ll fix it now. It is correct to add sugar to the crust.